Imagine cooking and baking in a kitchen that has been custom designed and built to reflect your beautiful style and cater to your unique needs. It would be more enjoyable than ever before to cook elaborate holiday feasts, put together delicious everyday meals, and entertain friends in the heart of your home. For the kitchen makeover of your dreams, turn to the skilled professionals at Star Home Remodeling. We can renovate the kitchen in your Frisco, Texas, home, turning it into the space you’ve always dreamed of having. 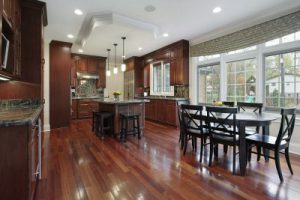 As a full-service home remodeling company, we can take care of all aspects of your kitchen renovation. To begin the process, we’ll meet with you at our showroom or your home so that we can learn more about the vision you have for your new space. We’ll also take the time to educate you about all of the options available to you so that you can make the best decisions and stay within budget. As a transparent and no-nonsense company, we pride ourselves on always being upfront about costs. This ensures that we are all on the same page through both the design and build phase of your kitchen makeover. Furthermore, you can look forward to receiving five-star customer service throughout your entire project. Our commitment to customer satisfaction and stunning renovations has earned us several accolades throughout our many years in business, including multiple Best of Houzz awards. Are you ready to enjoy the kitchen of your dreams? If so, contact Star Home Remodeling today. One of our friendly and experienced associates will be happy to answer any questions you have and speak with you further about the kitchen makeover we can complete at your Frisco, TX, home.